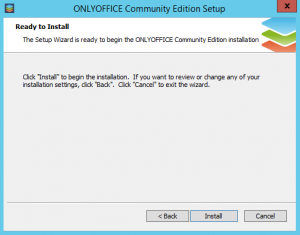 How to install ONLYOFFICE Community Edition on Windows? We are continually working to simplify the ONLYOFFICE installation. Last week we have released a new solution that allows you to easily deploy ONLYOFFICE Community Edition – Community Server and Document Server – on a single Windows machine. So we’ll see how it works out. 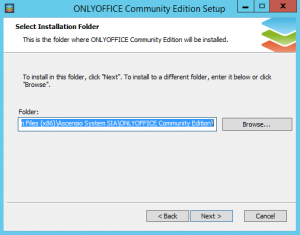 Go to SourceForge and download the latest version of ONLYOFFICE Community Edition – ONLYOFFICE_Community_Edition_Win-install. (version number).exe. Just click the corresponding link and save the .exe file to your machine. Install the prerequisites. Double-click the downloaded file and follow the Prerequisites Wizard instructions to install prerequisites required to run Community Edition. 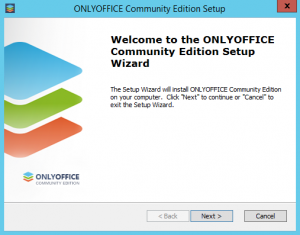 Install ONLYOFFICE Community Edition following the instructions of the Community Edition Setup Wizard that will be launched automatically as soon as all the prerequisites are installed. – Read the GNU AFFERO GENERAL PUBLIC LICENSE carefully and check the I accept the terms in the License Agreement option if you agree with them. 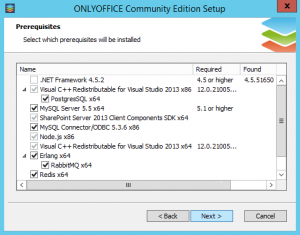 – Select an installation folder for Community Edition. By default it will be installed to the following folder: C:\Program Files\Ascensio System SIA\ONLYOFFICE Community Edition\. – Start the installation process. It may take several minutes. 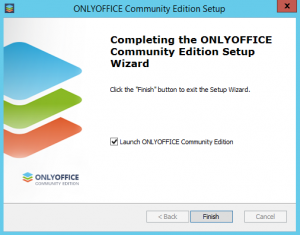 Run ONLYOFFICE Community Edition clicking the Finish button. The welcome page of your web office will be opened. Enter all the required data to access it and start working.